Olive Oil, Olive (Olea Europaea) Leaf Extract, Gelatin (Bovine), Glycerol (bulking agent), Zinc Gluconate, Soy Lecithin (emulsifier) Caramel (colour) Water, Beeswax (stabiliser), Copper Gluconate (providing Elemental Copper) Silicon Dioxide (anticaking agent), Xanthan Gum (thickener) Titanium Dioxide (colour). 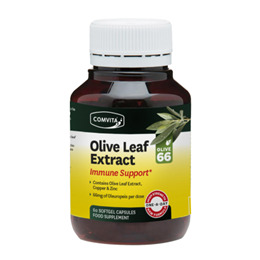 Below are reviews of Comvita Olive Leaf Extract High Strength - 60 Softgels by bodykind customers. If you have tried this product we'd love to hear what you think so please leave a review. Learnt about these from a nurse when I was in Australia, just what I wanted. This is the first time I have used olive leaf extract and I am very pleased with it. It arrived promptly. Great product. Have always found olive leaf effective and pleased with Comvita's product. Delivery was prompt too. Great product at very good price. Very prompt service as always. Excellent product at competitive price - quick dispatch!